David Forrest Reinventing Your Career & Resume Service is not a 10 Laws or 15 Steps Guide to reinvent your career. It is a DEFINITIVE 12-page report personally written by David Forrest based on your birth date and Chinese astrology and comes with his proprietary "Ten Years Career Life Path Cycle". This report is personalized for you which will show your career path for the next 50 years. There is nothing else you will ever need as this report will provide you with the answers to every single uncertainty you ever had about your career. Reinvent your Career & Resume! The above trial and error solution is not workable because you are asked to experiment and get into small baby steps with internships , job shadowing and all different approaches to test your career , before the final plunge. This is the same issue with all best selling Amazon books written to reinvent your career. This is not a working solution because it can never address your innate born skill set with your "Ten Years Career Life Path Cycle". David Forrest does not need you to answer 100++ questionnaire , as he already has the answers before he meets with you. Why and How is David Forrest Successful to help you to reinvent your career? 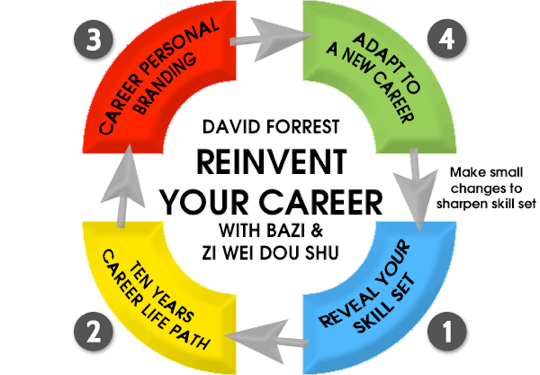 Chinese astrology Bazi and Zi Wei Dou Shu is able to reveal your innate skill set and combined with David’s 15 years research and vast data bank of successful clients he is able to laser focus on how to reinvent your career. His other tool is a proprietary graphic presentation of your "Ten Years Career Life Path", which clearly shows your career journey and how David will guide you in his reports and discussion. David’s "Ten Years Life Path" is a based on 99% accuracy and just to know your career path is worth the meeting sessions. All you have to do is tell David your birth date and email your resume/CV showing current job titles ( brief job descriptions of each title) for the last ten years and let David tell you what are your skill set and how to manage your skill set with further education and get the choice job based on your skill set and your "Ten Years Life Career Path Cycle"
With your birthdate and CV, David will write his 12 page report on your skill set , required further education and career choice based on his proprietary "Ten Years Career Life Path". This report is your bible to reinvent your career. It is that easy... WHY ? David leverages his intense 15 years studies in Chinese astrology , Bazi and Zi Wei Dou Shu to design your "Ten Years Career Life Path Cycle" , and gives you the answer to best career choice. Is that simple and he will spend more than 3++ hours discussing your career developments. 2.Describe the job requirements you must avoid. 3.Show the best ways you can develop to be more successful. Your skill set is more crucial to understand, than the job specification or industry’s fraternity. 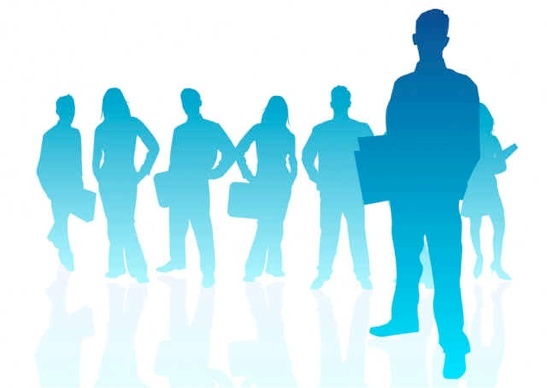 If you have an MBA in IT and working in a role of managing IT systems, like networks and POS , but your skill set is a strategic planner in managing resources then you have should get into a career which positions your Personal Brand as a Strategic Planner and not an IT manager of systems. Hiring managers, have goals they need to meet. David Forrest’s mission is to prove—in tangible ways—that you can be a valuable asset to them in reaching those objectives. Minimize translation failure by learning with David Forrest, how to repackage your background so that it highlights those skills that will be directly useful in helping you succeed in your new role. Your skills never change but in the correct career, you sharpen these skills and they are yours for life and allows you to adapt to en jobs in new industries with the same skill set. You can leave one industry and enter another which in 15 to 20 years requires your skill set. No one can rob you of your skill set. 2. "Ten Years Career Life Path"
This is the key to understand why your need to reinvent your career and resume, as new opportunities are in your "Ten Years Career Life Path" and David will take you through your next 30 to 50 years in your career life path and vista of your opportunities, adapting your skill set for the changes. This will make your forever relevant in your skill set . 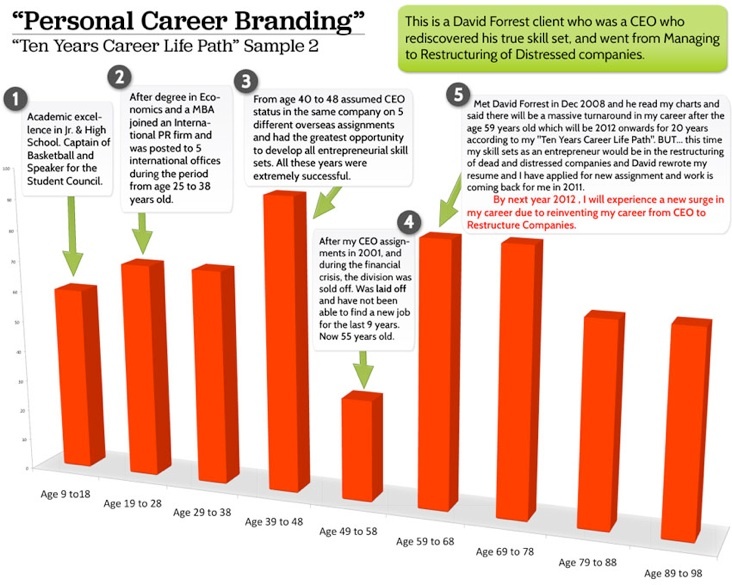 Please refer to samples below which are true cases of David Forrest clients for your understanding of David’s proprietary career life charts. Career consultants will never be able to provide you with these similar life paths, as these are based on Chinese astrology and is your own personal life path. With your skill sets and your "Ten Years Career Life Path", you will have the most crystalized directions how to reinvent your career. These adjustments and adaptations are to guide you and takes away the fears, unknowns and uncertainties and give you definitive goals and task to reinvent you career. After your first meeting session , you will feel a sense of purpose and become focused on how all your energy will be directed to your new invented career. Life will take on a new breath of fresh air and your inner mind and emotions will experience clarity and a definitive positive sense of achievement is within your personal reach. (David is not rewriting your educations and previous employment CV, he may ask you to draft some sentences to be more proactive in your actual achievements, especially in metric terms). David will write your introductory letter which is about your skill sets and define your goals and contribution you will bring to your employer. This will be a 1 1/2 page introductory letter. 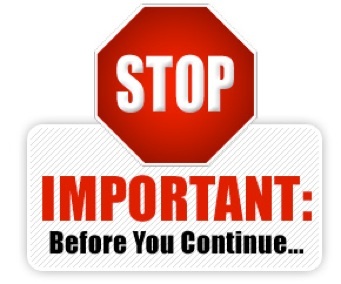 Yout resume will clearly state the positive benefit you will bring to the organization , such as an increase in revenue , a reduction in cost and streamlined processes or system , or improve morale. What David will write will be based on your skill set and "Ten Years Life Path" and will be achievement you can accomplish and will be in your destiny. David will never ask you for the impossible as this is not the purpose of his intentions to write your resume. David Forrest will provide you with all the potential career options and also the path to re-educate yourself and hone your skill set (Core Competencies, Values, Beliefs and Behaviours) which will be related to your "Ten Years Career Life Path". How is career reinvention different from career change? What is Reinventing Your Career? In this day and age, the ability to reinvent yourself—to recombine your skills, talents, and experience to move between job functions, departments, or industries—is the new form of job security. More than just repackaging your background, career reinvention involves changing your assumptions about how your career will evolve. This is presented in David Forrest "Ten Years Career Life Path" charts. It means being prepared to take advantage of new opportunities by developing your skill sets with a strategic eye toward emerging new business models and opportunities. Invent your career does not consider the industry best for you , but first explains your best skill sets and relate this to the new industries and opportunities which will have a demand for your skill set. How do you take Advantage of Opportunities with your Skill Sets and hone your skill sets to remain relevant in your life time work ? David gives you the answer in his 12 page personalized written report and is factual , your born skill sets which is your Core Competencies, Values, Beliefs and Behaviours and relate it to your "Ten Years Career Life Path Cycle"
All you need is simply 3++ hours with David Forrest to discuss this 12 page report. No motivational speech from David , simply the truth , your skill set , "Ten Years Career Life Path" and his immediate action, a plan to make the changes and reinvent your career. The new challenges facing all young men and women below the age 30-40 is not job redundancy but how to stay relevant with your born skill set which are Core Competencies, Values, Beliefs and Behaviours. Yes, staying relevant beyond the next 25 years is today the key driving force for your happiness with family , wealth and living your life style of choice and stop been a prisoner of your job. Take control of your life and career with the help of David Forrest or end up in a massive “cemetery of dead jobs”. Millions of people around the world are employed in the wrong jobs and are simply unhappy , discontented and extremely weak contributors to their family ,self , company and to their community. 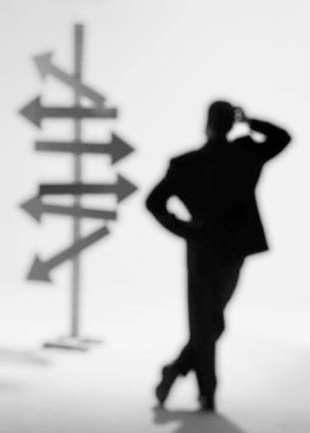 How can your resolve this career dilemma in your life? Meet David Forrest and in 3++ hours , your life will be totally energized and your career will take a 180% turn for the best enriching experience. You will have clear answers and directions , written and shown to you with goals and timeline for you to reinvent your career . This will be a truly inflection point in your life. According to Michael Gurian, family therapist, New York Times bestselling author, and co-founder of the Gurian Institute, brain research proves that we are born with 75 percent of our future inborn. "to pull out the innate ability". Parents have a responsibility to pull out the original large potential capabilities any child was born with to the fullest extent through education. From a perspective of molding the child into what the world requires, to one of nurturing the nature of the child to be successful in the world. This is contrary to the research of thirty, twenty, even ten years ago when researchers assumed that nurture and socialization were 90 percent of what makes children into the adults they become. 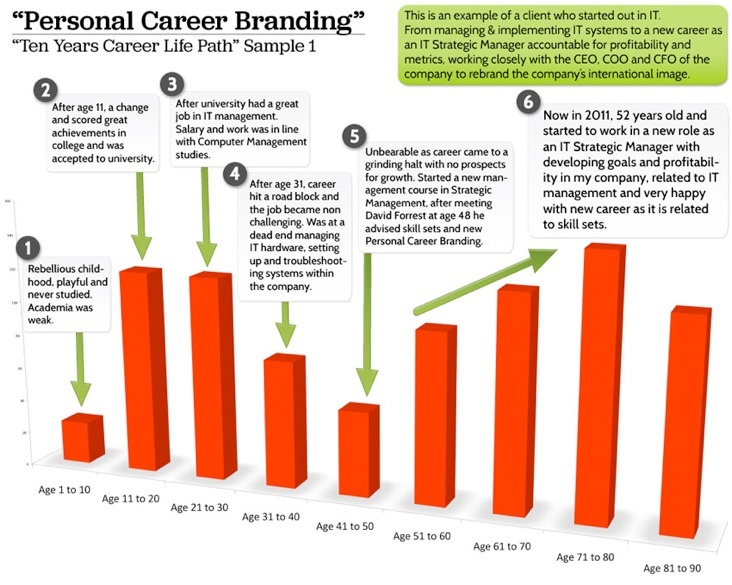 "Ten Years Life Career Path Cycle"? Yes, based on astrology we own a very personalized "Ten Years Life Career Path Cycle" which will not only change your career but demands you make a career change and David will provide you with your career charts. No more trial and error in your career choice. "Ten Years Life Career Path Cycle" is a David Forrest’s proprietary and empirical presentation of your career success and life journal. David has invested more than 10 years in research and case studies of his clients to build his proprietary "Ten Years Life Career Path Cycle" and without this , it is useless , yes useless to even begin to reinvent you career. How Much Time Do I Need to Spend with David Forrest to Reinvent my Career? Let David Forrest answer this for you 3++ hour meeting which will be a hard talk and a no holds bar meeting, which will get you the answer with just one meeting. Thousands have experienced this change in their life and have found reinventing their career is not a magical revelations. Your innate career skill set are already embedded in your birth DNA when you were born and during your education to age 24 , you probably drifted into a discipline or higher studies which was convenient at that time. You started your working career from age 24 onwards, and by early 30‘s you were married and has to manage a family, and not given yourself the opportunity to understand if this is your career and work has becomes a humdrum , until one day because of a major recession or job cuts , there is a sudden realization your career has been redundant. •The job is not challenging me. •I can contribute 10 X more and simply do not know how and why. •Do you HATE your work? Dread going in on Monday? Considering quitting your job? •My bosses are happy with me , but my promotion and salary are stagnant. •The company is performing well , yet I am left behind. •Low self esteem in the job. •I am bored at work , as the work is done in less than 3 hours in the day and I am pretending to be busy to idle my time away. •My career conflicts with the life I want to live. •The job is affecting my personal life and family. •I feel like a another clog in the wheels of the company’s progress. •I seem to have reached the limit of my contributions in the company , yet I have 500 % more to contribute and seem lost as to the how I can make this happen. 1.David does not believe in a 3 day workshop or an attempts to motivate you to make a change.  Motivation is not the answer to reinventing your career. Your revealed true skill set is the answer. 2.David does not believe in the 10 page worksheet for you fill up to find your skill set. 3.David does not believe for you to anticipate the changes in the global economy to understand your career choice. 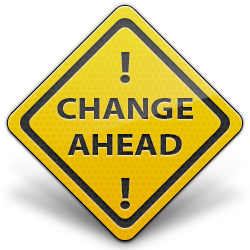 4.David does not believe for you to anticipate social and political changes to remain adaptive and relevant in your career. 5.David does not believe in all the fashionable 10 Steps to Reinvent You Career , written in 100’s of books available on Amazon and best seller’s list, and services offered by Career Consultancy Services. A Typical Career Advisor will follow this standard procedure by asking YOU, YES(!  ), asking YOU to list your own skill set. Not being able to know your innate skill set, all they are doing is leeching on your own thoughts and eureka they have your career choice from your answers to these questions. 1.Clarify what you want from your work life. 2.Identify what's missing from your current position. 3.Determine what work situations would fulfill you. 4.Experiment with different careers, hoping to find the answer by chance. 1 in 3 graduates is in a job that does not require a degree, (but have graduates filling the job anyway) according to new research that suggests mass higher education is producing a cohort of over-qualified young people whose career ambitions may never be fulfilled. 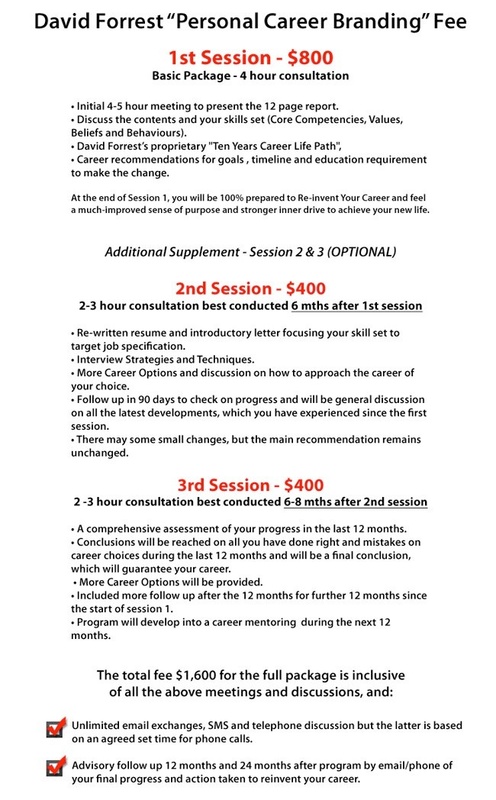 David Forrest will give you an accurate,definitive and a personalized 12 page blueprint report to reinvent your career and he will also rewrite your resume that will avoid the “trash” button by your potential employer or HR manager. David Forrest does not subscribe to any of these steps to reinvent your career because they are all open-ended and meaningless cliches. Ask yourself, if you practice any or all these 10 steps will these “steps” get you close to your correct career? 1.Think outside the box. You cannot discover yourself by introspection. 2.Focus your attention on which of your many possible selves you want to test and learn more about. 3.Take small baby steps to try different mode of your career choice and find the right one from trial and error. 4.Step back. But not for too long. 5.Seize opportunities. Change happens in bursts and starts. There are times when you are open to big change and times when you are not. 7.Stay nimble and engaged in your work. 8.Change your social network with a hope of finding a new career avenue. 10.Stay focused on the dream. 95% of people polled on the above 4 questions have no idea how to clarify, identify, determine or experiment with their work or career. It is at best a guessing game to tell the coach your “wish list” career and this is what the 4 questions are attempting to address: your personal “wish list” career. Your own “wish list” becomes a self-introspection/assessment to your new career starting point, arriving at possible career alternatives complimenting this information with experiments in the real world (internships, voluntary work, job shadowing and so on) refining the self assessment and career alternatives accordingly. The whole process above is a weak and futile attempt to help anyone to reinvent their career. Most career consultants will ask to speak with you on the phone or meet in a free consultation to get at the “wish list” in your mind and turn this for you as their idea of the best choice career and give you some recommendations. David Forrest will make sure you NEVER BECOME IRRELEVANT in your career or be in a redundant job.  As soon as you complete your payment, you will receive a link to an online questionnaire. You can complete the questionnaire whenever you have about 30 minutes of uninterrupted time. Meeting your coach ,you'll get clear about what you want to accomplish and what's stopping you. You'll discuss your next steps and make choices. We are sure you will find it a very valuable experience that helps you take a fresh step forward with your career challenges. The flaw with the above typical approach , you are fulfilling your wish list and fantasy dream career and is not your true calling based on your inborn skill set. Only Chinese astrology can review your skill set and has been tested successful by David Forrest with thousands of his clients. 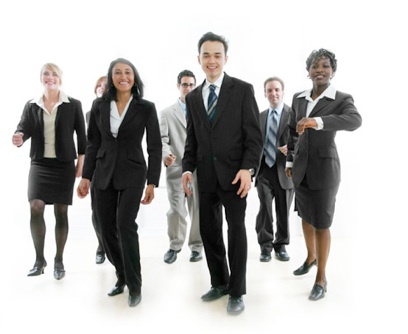 Your coach will be someone who has some experience in an industry which has been singled out from your questionnaire. Wait no more, make your appointment with David Forrest today and start your new exciting career journey! Today research has confirmed that at least 75% of a child innate talent is built into their DNA and is nature and not nurturing and why Chinese astrology has become one of the most powerful tools to understand and reveal your career future through your birth charts as all the related details to reinvent your career can be decoded from your birth chart. This should have been done when you were 10 years old , but it is never too late to understand and make the change for your success in the next 30 to 40 years. David Forrest has designed 4 major charts with intense research and they are 99% accuracy for your career choice and will reveal all this to you. 21st Century Challenge ... 600 million graduates competing for a global job. The challenges in your career today began 5 years ago. Every year, the annual global graduates churned out from all universities is 25 million and in the next 25 years there will be an additional 625 million young men and women. There will be not enough meaningful jobs as it is impossible to create 600 million new jobs in 25 years, which is 4 times the size of USA 2011 employment numbers. China and India will annually graduate 10 million , well spoken and educated at the highest level and the world job market is borderless and means every one of the 625 million can work anywhere in the world. Do you find the numbers frightening? Your challenges are not just bread and butter issues, but... will you stay relevant in your skill set? Adaptive, mobile and ready for the greatest challenge in the 21st Century? Personal Mentoring | Business Model Mentoring | Are You An Entrepreneur?